Tulu (Tulu: ತುಳು ಭಾಷೆ Tulu bāse [ˈt̪ulu ˈbɒːsæ]) is a Dravidian language spoken mainly in the south west part of the Indian state of Karnataka and also in the Kasaragod district of Kerala. The Tulu speaking region is often referred to as Tulu Nadu. The native speakers of Tulu are referred to as Tuluva or Tulu people. (Dakshina Kannada and Udupi district of Karnataka and Kasaragod district of Kerala). Tulu is written in a non-Latin script (Kannada or Tigalari). Tulu text used in this article is transliterated into the Latin script according to the ISO 15919 standard. Separated early from Proto-South Dravidian, Tulu has several features not found in Tamil–Kannada. For example, it has the pluperfect and the future perfect, like French or Spanish, but formed without an auxiliary verb. Robert Caldwell, in his pioneering work A Comparative Grammar of the Dravidian or South-Indian family of languages, called this language "peculiar and very interesting". According to him, "Tulu is one of the most highly developed languages of the Dravidian family. It looks as if it had been cultivated for its own sake." Tulu is the primary spoken language in Tulu Nadu, a region comprising the districts of Dakshina Kannada and Udupi (except kundapura Taluk and kota of udupi district where people speak in kundapura kannada), in the west of the state of Karnataka and the Kasaragod taluk. Non-native speakers of Tulu include those who speak the Beary language, Havyaka and Gowda dialects of Kannada as also Konkani, Koraga and Malayalam speakers resident in the Tulu Nadu region. Apart from Tulu Nadu, a significant emigrant population of Tulu speaking people is found in Maharashtra, Bangalore, Chennai, the English-speaking world, and the Gulf countries. The various medieval inscriptions of Tulu from the 15th century are in the Tigalari or Tulu script. Two Tulu epics named Sri Bhagavato and Kaveri from the 17th century were also written in the same script. However, in modern times the Tulu language is mostly written using the Kannada script. The Tulu language is known for its oral literature in the form of epic poems called Paddana .The Epic of Siri and the legend of Koti and Chennayya belong to this category of Tulu literature. Tulu belongs to the southern branch of the family of Dravidian languages. It descends directly from Proto-Southern Dravidian, which in turn descends directly from Proto-Dravidian, the hypothesised mother language from which all Dravidian languages descend. The Tulu language originates in the southern part of India. Linguists Purushottama Bilimale (ಪುರುಷೋತ್ತಮ ಬಿಳಿಮಲೆ) have suggested that the word "Tulu" means "that which is connected with water", based on words from Kannada and Tamil. "Tulave" (jack fruit) means "watery" in Tulu; and, other water-related words in Tulu include "talipu", "teli", "teLi", "teLpu", "tuLipu", "tulavu", and "tamel". In Kannada, there are words such as tuLuku means "that which has characteristics of water" and toLe In Tamil, thuli means drop of water; and, thulli means the same in Malayalam. Tulu is not currently an official language of India or any other country. Efforts are being made to include Tulu to the 8th Schedule of the Constitution. In August 2017, an online campaign was organized to include Tulu to 8th schedule of constitution and in October 2017, when the prime minister, Narendra Modi visited Dharmasthala Temple same demand was presented in front of him.. Similarly, in 2018, the Member of Parliament from Kasargod constitutency P. Karunakaran also rose the same demand for inclusion of Tulu language in the 8th schedule of the constitution. The oldest available inscriptions in Tulu are from the period between 14th to 15th century AD. These inscriptions are in the Tigalari script and are found in areas in and around Barkur which was the capital of Tulu Nadu during the Vijayanagar period. Another group of inscriptions are found in the Ullur Subrahmanya Temple near Kundapura. Many linguists like S.U. Panniyadi and L. V. Ramaswami Iyer as well as P.S. Subrahmanya suggested that Tulu is among the oldest languages in the Dravidian family which branched independently from its Proto-Dravidian roots nearly 500 years ago. This assertion is based on the fact that Tulu still preserves many aspects of the Proto-Dravidian language. This dating of Tulu is also based on the fact that the region where Tulu is natively spoken was known to the ancient Tamils as Tulu Nadu. Also, the Tamil poet Mamular who belongs to the Sangam Age (200 AD) describes Tulu Nadu and its dancing beauties in one of his poems. In the Halmidi inscriptions one finds mention of the Tulu country as the kingdom of the Alupas. The region was also known to the Greeks of the 2nd century as Tolokoyra. The history of Tulu would not be complete without the mention of the Charition mime, a Greek play belonging to 2nd century BC. The play's plot centres around the coastal Karnataka, where Tulu is mainly spoken. The play is mostly in Greek, but the Indian characters in the play are seen speaking a language different from Greek. There is considerable ambiguity regarding the Indian language in the play, though all scholars agree the Indian language is Dravidian, but there is considerable dispute over which one. Noted German Indologist Dr. E. Hultzsch was the first to suggest that the language was Dravidian. [clarification needed] The dispute regarding the language in the play is yet to be settled, but scholars agree that the dispute arises from the fact that Old Kannada, Old Tamil and Tulu during the time when the play was written were perhaps dialectical variations of the same proto-language, and that over the years they evolved into their present forms as separate languages. Tulu is widely considered one of the most rich and well organized for many reasons. Found largely in Karnataka, it is spoken primarily within the Indian state. Dating back several hundred years, the language has developed numerous defining qualities. The Tulu people follow a saying which promotes leaving negative situations and finding newer, more positive ones. The language, however, is not as popular as others which means it could become endangered and extinct very soon. The influence of other mainstream languages is present danger for the Tulu people. With the right degree of awareness, we can help promote Tulu to more people who may appreciate it and its uniqueness. Today, it is spoken by nearly 1.8 million people around the globe. Large parts of the language are altered and changed constantly because it is commonly passed down through oral tradition. Oral traditions within Tulu have meant that certain phrases have not always maintained the same meaning or importance. According to Malayalam works like Keralolpathi and Sangam literature in Tamil, the region stretching from the Chandragiri river, now part of the Kasaragod district, Kerala, to Gokarna, now part of Uttara Kannada district of Karnataka, was ruled by the Alupas and was known as Alva Kheda. This Kingdom was the Homeland of Tulu speaking people. However the present day Tulu linguistic majority area is confined to the region of Tulu Nadu, which comprises the districts of part of Dakshina Kannada and Udupi in the Indian state of Karnataka and the northern part of Kasaragod district of Kerala up to the river Payaswani also known as Chandragiri. The cities of Mangalore, Udupi and Kasaragod being the cultural centres of Tulu culture. Tuluvas have a saying: "Oorudu nanji aanda paardh badkodu" . A loose translation would be: "If it's tough at home; run away and survive". Tuluvas are true to this character and have migrated to other places in great numbers. Early migration was to neighbouring regions like Malabar (now Kerala), Mysore kingdom, Madras Presidency ( Tamil Nadu now - areas like salem, attur, chinnasalem, thiruvannamalai, villupuram, vellore, chennai and perambalur). The large scale migration of Tulu speaking people from undivided dakshina Kannada district to other provinces (regions) of India happened during World War I, but there is no concrete materialistic evidence to prove. The reason being rationing of food grains by British who were ruling India then and spread of communicable diseases. The next wave of emigration was during World War II, now they settled in interior parts of Karnataka, coastal Andhra Pradesh and also far off cities like Mumbai and Chennai. They mostly ran restaurants serving Udupi cuisine. Mumbai and Thane in Maharashtra state has a sizable population of Tuluvas. Even today Tulu is widely spoken in the Dakshina Kannada, partially in Udupi district of Karnataka state and to some extent in Kasaragod of Kerala. Efforts are also being made to include Tulu in the list of Official languages of India. As a whole, Tulu is largely contained to the southern part of India. The Indian state of Karnataka is where the language seems to thrive in the present day. Some of the major cities within the Tulu culture include Kasaragod and Mangalore. Speakers of the language have reflected interest in spreading to more modern nations such as the United States. The various historical inscriptions of Tulu found around Barkur and Kundapura are in the Tigalari script. The Kannada script has become contemporary script for the Tulu language gradually. All contemporary works and literature are done in the Kannada script. Historically, Brahmins of Tulu Nadu and Havyaka Brahmins used the Tigalari script to write Vedas and other Sanskrit works. The Tigalari script is descended from the Brahmi through the Grantha script. It is a sister script of the Malayalam script. However, very few works written in vernacular languages like Kannada and Tulu are available. Hence, the Tigalari script was employed by Tulu Brahmins to write Tulu and Kannada languages apart from the Kannada script. The National Mission for Manuscripts has conducted several workshops on this script with the help of a scholar, Keladi Gunda Jois. In the 18th century, the use of the Kannada script for writing Tulu and non-availability of print in the Tigalari script contributed to the marginalization of the Tigalari script. Currently, the script is studied by few scholars and manuscriptologists for research and religious purposes. Although its contents is largely derived from the Kannada language, there is proof that Tulu may have been before others in the Dravidian family. The Kannada script has become the contemporary script for the Tulu language gradually. All contemporary works and literature are done in the Kannada script. Tulu language has four dialects, which are broadly similar, with slight variations. Central Tulu: Spoken in Mangalore. Northwest Tulu: Spoken in Udupi. Northeast Tulu: Spoken in Karkala and Belthangady. Southwest Tulu: Spoken in Manjeshwar and Kasaragod, known as Kasaragod Tulu influencing Malayalam. Southcentral Tulu: Spoken in Bantwal,. Southeast Tulu: Spoken in Puttur Sullia. Southern Tulu: Spoken in South of Kasaragod and Payaswini (Chandragiri) river influencing Malayalam known as Thenkaayi Tulu. Brahmin Tulu: Spoken by the Tulu Brahmins who are subdivided into Shivalli Brahmins, Sthanika Brahmins and Tuluva Hebbars. It is slightly influenced by Sanskrit. Jain Dialect: Spoken by the Tulu Jains. It is a dialect where the initial letters 'T' and 'S' have been replaced by the letter 'H'. For example, the word Tare is pronounced as Hare, Saadi is pronounced as Haadi. Girijan Dialect: Spoken by the Koraga, Mansa, other Girijans and Tribal classes. Five short and five long vowels (a, ā, e, ē, u, ū, i, ī, o, ō) are common in Dravidian languages. Like Kodava Takk (and also like Konkani and Sinhala), Tulu also has an [ɛ]- or [æ]-like vowel, generally occurring word-finally. Kannada script does not have a symbol to specifically represent this vowel, which is often written as a normal e. For example, the first person singular form and the third person singular masculine form of a verb are spelled identically in all tenses, both. ending in e, but are pronounced differently: the terminating e in the former sounds nearly like ‘a’ in the English word ‘man’ (ಮಲ್ಪುವೆ maḷpuve /maɭpuvæ/, "I make"), while that in the latter like ‘e’ in ‘men’ (ಮಲ್ಪುವೆ maḷpuve /maɭpuve/, "he makes"). Paniyadi in his 1932 grammar used a special vowel sign to denote Tulu /ɛ/ in the Kannada script: according to Bhat, he used two telakaṭṭus for this purpose (usually, a telakaṭṭu means the crest that a Kannada character like ಕ, ತ, ನ has), and the same convention was adopted by Upadhyaya in his 1988 Tulu Lexicon. The long counterpart of this vowel occurs in some words. In all dialects, the pair /e/ and /ɛ/ contrasts. Additionally, like Kodava Takk and Toda, and like Malayalam saṁvr̥tōkāram, Tulu has an [ɯ]-like vowel (or schwa /ə/) as a phoneme, which is romanized as ŭ (ISO), ɯ, or u̥. Both J. Brigel and A. Männer say that it is pronounced like e in the French je. Bhat describes this phoneme as /ɯ/. However, if it is like Malayalam "half-u", [ə] or [ɨ] may be a better description. In the Kannada script, Brigel and Männer used a virama (halant), ್, to denote this vowel. Bhat says a telakaṭṭu is used for this purpose, but apparently he too means a virama. The contrast between /l/ and /ɭ/ is preserved in the South Common dialect and in the Brahmin dialect, but is lost in several dialects. Additionally, the Brahmin dialect has /ʂ/ and /ɦ/. Aspirated consonants are sometimes used in the Brahmin dialect, but are not phonemic. In the Koraga and Holeya dialects, s /s/ and ś /ʃ/ merge with c /t͡ʃ/ (the Koraga dialect of the Tulu language is different from the Koraga language). Word-initial consonant clusters are rare and occur mainly in Sanskrit loanwords. As noted in 'Dialects/Varieties', the Tulu alphabet resembles the Malayalam script in many ways. It is also similar to many characters found in the Tigalari alphabet. This is from the same region in the state of Karnataka. The Tigilari and Kannada alhpabets include a stress on vowels with "a" and "o"sounds. Other vowels include sounds such as "au" "am" and "ah". Numerous consonants have their own origin from the Dravidian languages like "kha" "gha" "dha" and "jha". These are derived from the Tigalari alphabet. Tulu has five parts of speech: nouns (substantives and adjectives), pronouns, numerals, verbs, and particles. Substantives have three grammatical genders (masculine, feminine, and neuter), two numbers (singular and plural), and eight cases (nominative, genitive, dative, accusative, locative, ablative or instrumental, communicative, and vocative). According to Bhat, Tulu has two distinct locative cases. The communicative case is used with verbs like "tell", "speak", "ask", "beseech", "inquire", and denotes at whom a message, an inquiry, or a request is aimed, as in "I told him." or "I speak to them." It is also used to denote relationship with whom it is about, in a context like "I am on good terms with him." or "I have nothing against him." Bhat calls it the sociative case. It is somewhat similar to the comitative case, but different in that it denotes communication or relationship, not physical companionship. The plural suffix is -rŭ, -ḷu, -kuḷu, or -āḍḷu; as, mēji ("table"), mējiḷu ("tables"). The nominative case is unmarked, while the remaining cases are expressed by different suffixes. The following table shows the declension of a noun, based on Brigel and Bhat (u̥ used by Brigel and ɯ used by Bhat are both shown as ŭ for clarity): when two forms are given, the one in parentheses is by Bhat, and the other is by Brigel. Some of these differences may be dialectal variations. marā O tree! marokuḷē (marakulɛ̄) O trees! The personal pronouns are irregularly inflected: yānŭ "I" becomes yen- in oblique cases. Tulu makes the distinction between the inclusive and exclusive "we" (See Clusivity: Dravidian languages): nama "we (including you)" as opposed to yenkuḷu "we (not including you)". For verbs, this distinction does not exist. The personal pronouns of the second person are ī (oblique: nin-) "you (singular)" and nikuḷu "you (plural)". Three genders are distinguished in the third person, as well as proximate and remote forms. For example, imbe "he (proximate)", āye "he (remote)". The suffix -rŭ makes a polite form of personal pronouns, as in īrŭ "you (respectfully)", ārŭ "he (remote; respectfully)".Postpositions are used usually with a noun in the genitive case, as in guḍḍe-da mittŭ "on the hill". Tulu verbs have three forms: active, causative, and reflexive (or middle voice). They conjugate for person, number, gender, tense (present, past, pluperfect, future, and future perfect), mood (indicative, imperative, conditional, infinitive, potential, and subjunctive), and polarity (positive and negative). Each sentence is composed of a subject and a predicate and every sentence is a full speech or thought in words. There is both singular and plural while being expressed in first through third person. There are several exceptions to each of these depending on the instance. For example: the verb has to be in a plural style if there are numerous nominatives within a sentence or of different genders that agree with the previous sentence. The verb may also be omitted in some sentences. Present tense and past tense may change and their perception. This script was mainly used to write religious and literary works in Sanskrit. Even today the official script of the eight Tulu monasteries (Ashta Mathas of Udupi) founded by Madhvacharya in Udupi is Tulu. The pontiffs of the monasteries write their names using this script when they are appointed. Modern-day Tulu literature is written using the Kannada script. Mandara Ramayana is the most notable piece of modern Tulu literature. Written by Mandara Keshava Bhatt, it received the Sahitya Academy award for best poetry. Madipu, Mogaveera, Saphala and Samparka are popular Tulu periodicals published from Mangalore. The Tulu Sahitya Academy, established by the state government of Karnataka in 1994, as also the Kerala Tulu Academy established by the Indian State Government of Kerala in Manjeshwaram in 2007, are important governmental organisations that promote Tulu literature. Nevertheless, there are numerous organisations spread all over the world with significant Tulu-migrated populations that contribute to Tulu literature. Some notable contributors of Tulu literature are Kayyar Kinhanna Rai, M. K. Seetharam Kulal, Amruta Someshwara, B. A. Viveka Rai, Kedambadi Jattappa Rai, Venkataraja Puninchattaya, Paltadi Ramakrishna Achar, Dr. Sunitha M. Shetty, Dr. Vamana Nandavara, Sri. Balakrishna Shetty Polali. The oral traditions of Tulu are one of the major traditions that greatly show the finer aspects of the language. The following are various forms of Tulu oral tradition and literature. Paddanas: A form of oral epic poem sung in a highly stylised manner during the Hindu rituals of Bhuta Kola and Nagaradhane, which are peculiar to the Tulu people. These Paddanas are mostly legends about gods or historical personalities among the people. The longest of them being Siri Paddana, which is about a woman called Siri who shows strength and integrity during adverse times and in turn attains divinity. The Paddana greatly depicts the independent nature of the Tulu womenfolk. The entire Paddana was written down by Finnish scholar Lauri Honko of the University of Turku and it falls four lines short of Homer's Iliad. Riddles: They are another important aspect of Tulu oral traditions. These riddles are largely tongue twisting and mostly deal with kinship and agriculture. Bhajans: Bhajans sung in numerous temples across the Tulu region are varied and are dedicated to various gods and goddesses. Most of these are of the Hindu tradition, others being Jain. They are sung in both the Carnatic style as well a style similar to what is used in Yakshagana. Kabitol: Songs sung during the cultivation of crops, the traditional occupation of the people. O Bele is considered the finest among them. Theatre in the form of the traditional Yakshagana, prevalent in coastal Karnataka and northern Kerala has greatly preserved the finer aspects of the Tulu language. Yakshagana which is conducted in Tulu is very popular among the Tuluva people. It can also be seen as a form of temple art, as there are many Yakshagana groups that are attached to temples, for example that of Kateel Durga Parameshwari Temple as also the Udupi Krishna Temple. Presently, eight professional Yakshagana troupes perform Tulu-language Yakshagana not only during the Yakshagana season but also during the off-season in various places in Karnataka and outside. In Mumbai, Tulu Yakshagana is very popular among the Tulu audiences. More than 2,000 Yakshagana artistes take part in the performance in various places in Mumbai annually. Notable performers include Kalladi Koraga Shetty, Pundur Venkatraja Puninchathaya, Guru Bannanje Sanjiva Suvarna and Pathala Venkatramana Bhat. Tulu plays are among the major entertainment for admirers of art and culture in the Tulu Nadu. Tulu plays, generally centered on the comic genre, are very popular in Mumbai and Bangalore outside Tulu Nadu. In January 2019, Pilibail Yamunakka, released on 9th December 2018, has completed successful 50 days and has given the audience from coastal Karnataka and other places, a movie to cherish for a lifetime. The front cover of the Tulu dictionary published by Männer in 1886. Tulu as a language continues to thrive in coastal Karnataka and Kasaragod in Kerala. Tulu Sahitya Academy, an institute established by the state government of Karnataka, has introduced Tulu as a language in schools around coastal Karnataka, including Alva's High School, Moodbidri; Dattanjaneya High School, Odiyoor; Ramakunjeshwara English-medium High School, Ramakunja; and Vani Composite Pre-University College, Belthangady. Initially started in 16 schools, the language is now taught in over 33 schools, of which 30 are in Dakshina Kannada district. More than 1500 students have opted this language. Tulu is also taught as a language at the post graduate level in Mangalore University, and there is a dedicated department for Tulu studies, Translation and Research at Dravidian University in Kuppam Andhra Pradesh.The Government Degree College at Kasaragod in Kerala has also introduced a certificate course in Tulu for the academic year 2009-2010. It has also introduced Tulu as an optional subject in its Kannada post-graduation course. It has adopted syllabi from the books published by the Tulu Sahitya Academy. German missionaries Revs. 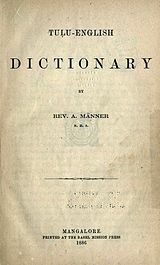 Kammerer and Männer were the first people to conduct research on the language. Rev. Krammer collected about 3,000 words and their meanings until he died. Later his work was carried on by Rev. Männer, who completed the research and published the first dictionary of the Tulu language in 1886 with the help of the then Madras government. The effort was incomplete, as it did not cover all aspects of the language. The Govinda Pai Research Centre at MGM College, Udupi started an 18-year Tulu lexicon project in the year 1979. ^ a b c d e f Steever, Sanford B (2015). The Dravidian Languages. Routledge. pp. 158–163. ISBN 9781136911644. ^ a b "ABSTRACT OF SPEAKERS' STRENGTH OF LANGUAGES AND MOTHER TONGUES - 2011" (PDF). www.censusindia.gov.in. Indian Census 2011, Government of India. Retrieved 7 July 2018. ^ "Indian Multilingualism, Language Policy" (PDF). Archived from the original (PDF) on 27 January 2005. Retrieved 21 May 2012. ^ Hammarström, Harald; Forkel, Robert; Haspelmath, Martin, eds. (2017). "Tulu". Glottolog 3.0. Jena, Germany: Max Planck Institute for the Science of Human History. in Tulu script, Kannada: ತುಳು ಬಾಸೆ in Kannada script . ಭಾಷೆ bhāṣe, ಭಾಶೆ, bhāśe, and ಬಾಶೆ bāśe are alternative spellings for the Tulu word bāse in the Kannada script. The correct spelling for the word "language" in Kannada is Kannada: ಭಾಷೆ bhāṣe, but that is not necessarily true in Tulu. Männer’s Tulu-English and English-Tulu Dictionary (1886) says, "ಬಾಶೆ, ಬಾಸೆ bāšè, bāsè, see ಭಾಷೆ." (vol. 1, p. 478), "ಭಾಶೆ, ಭಾಷೆ bhāšè, bhāshè, s. Speech, language." (vol. 1, p. 508), meaning that the four spellings are more or less acceptable. The word is actually pronounced ಬಾಸೆ bāse in Tulu. Note that š and sh in his dictionary correspond to ś and ṣ, respectively, in ISO 15919. ^ "UDUPI". Udupitourism.com. Retrieved 18 November 2016. ^ "Census of India - Statement 1". Registrar General & Census Commissioner, India. Retrieved 13 November 2009. ^ "Language Family Trees: Dravidian, Southern", Ethnologue (16th ed.). ^ Caldwell (1856), p. 35. ^ Raghuram, M. (16 July 2002), "Tulu Fit To Be Included in Eighth Schedule", The Hindu, Chennai, India: The Hindu Group. ^ "ದಕ್ಷಿಣ ಕನ್ನಡ ಜಿಲ್ಲೆ, ಮಂಗಳೂರು, ಕರ್ನಾಟಕ". Dk.nic.in. ^ Steever, Sanford B. (1998). The Dravidian Languages. Taylor & Francis. p. 158. ISBN 0-415-10023-2. ^ "Language in India". Language in India. 5 May 2003. Retrieved 21 May 2012. ^ "Serving Mangaloreans Around The World!". Mangalorean.Com. Retrieved 21 May 2012. ^ "Dr. Veerendra Heggade in Dubai to Unite Tuluvas for Tulu Sammelan". Daijiworld.com. Retrieved 21 May 2012. ^ "Centre still examining inclusion of Tulu, Kodava in 8th Schedule". Coastaldigest.com - The Trusted News Portal of India, Coastal Karnataka. 22 July 2017. ^ "Demand to include Tulu in Eight Schedule grows louder with PM's visit - Times of India". The Times of India. Retrieved 12 November 2017. ^ The Dravidian languages - Sanford B. Steever - Google Books. Books.google.co.in. Retrieved 21 May 2012. ^ A History of Ancient and Early ... - Upinder Singh - Google Books. Books.google.co.in. Retrieved 21 May 2012. ^ Brahmanas of South India - Nagendra Rao - Google Books. Books.google.co.in. Retrieved 21 May 2012. ^ a b "Tulu fit to be included in Eighth Schedule". The Hindu. Chennai, India. 16 July 2002. ^ "Teaching Tulu at primary level sought". The Times Of India. 25 January 2009. ^ "Tulu Nadu Movement Gaining Momentum". The Hindu. Chennai, India. 13 August 2006. ^ "Why Tulu Language Deserves Recognition from Kendra Sahithya Academy and Why It Should Be Included in Schedule 8B of the Constitution". Yakshagana.com. 12 August 2000. Retrieved 21 May 2012. ^ a b "Ethnologue report for language code: tcy". Ethnologue.com. Retrieved 21 May 2012. ^ a b "Places". Boloji.com. Retrieved 21 May 2012. ^ a b Bhat (1998), p. 163. ^ Brigel, J. (1872). "A Grammar of the Tulu Language". C. Stolz. p. 47. Retrieved 31 October 2009. ^ a b c d e f Bhat (1998), p. 161. ^ Bhat (1998), pp. 162–163. ^ Brigel (1872), p. 10. ^ Brigel (1872), pp. 10–11. ^ Brigel (1872), pp. 14–15. ^ Bhat (1998), p. 164. ^ Brigel (1872), p. 37. ^ a b Brigel (1872), p. 33. ^ Brigel (1872), p. 43. ^ Brigel (1872), p. 45. ^ "'Tulu is a Highly Developed Language of the Dravidian Family'". The Hindu. Chennai, India. 21 May 2009. ^ "Tulu Academy Yet to Realise Its Goal". The Hindu. Chennai, India. 13 November 2004. ^ Burnell (1874), p. 35. ^ K T Vinobha. "Pejawar pontiff signs mutt papers in Tulu". Times of India. Archived from the original on 13 January 2012. Retrieved 22 November 2011. ^ a b "Pejawar Seer's Signature Is in Tulu Script". The Canara Times. 12 October 2011. Retrieved 12 March 2012. ^ "D A I J I W O R L D". D A I J I W O R L D. Retrieved 21 May 2012. ^ "Ee Prapancha: Tulu Cinema at 35". Raveeshkumar.com. Retrieved 21 May 2012. ^ "Quiet voices from afar - Latest News & Updates at Daily News & Analysis". Dnaindia.com. 11 November 2006. ^ "Shutterdulai, First Remake in Tulu". Newindianexpress.com. ^ "Telugu blockbuster Brahomotsavam film team in a fix for copying Tulu song". News karnataka. ^ "Udayavani ePaper Sudina (Mangalore) Edition". Epaper.udayavani.com. Retrieved 1 October 2017. ^ "Welcome tuluacademy.org - BlueHost.com". Tuluacademy.org. ^ "626 students from 16 Dakshina Kannada schools opt for Tulu - Bangalore Mirror -". Bangaloremirror.com. ^ "1584 students take Tulu as 3rd language in undivided DK dist". India.com. 24 June 2017. ^ "Rediff On The Net: Now, Tulu has a real dictionary!". Rediff.com. Retrieved 21 May 2012. ^ Leena Mudbidri (8 December 2009). "Tulu Nighantu a Lexicon That Speaks a Million Words". ^ Special Correspondent (30 September 2011). "Varsity Okays Proposals to Offer Courses in Biotechnology, Tulu". The Hindu. Retrieved 2 October 2011. ^ TNN (30 September 2011). "MU to Offer Tulu Courses". The Times of India. Retrieved 2 October 2011. Burnell, Arthur Coke (1874), Elements of South-Indian Palæography from the Fourth to the Seventeenth Century A.D., Trübner & Co.
G., L. R. (2013). Elements of comparative philology. Place of publication not identified: Hardpress Ltd.
Maenner, A. (1886). Tulu-English dictionary: By Rev. A. Männer. Mangalore: Printed at the Basel Mission. C. (1875). A comparative grammar of the dravidian or south-Indian family of languages. London: Trübner and Co., Ludgate Hill. Bhatt, S. L. (2005). A grammar of Tulu: a Dravidian language. Thiruvananthapuram: Dravidian linguistics association. Goddard, C. (2009). The languages of East and Southeast Asia: an introduction. Oxford: Oxford Univ. Press. Padmanabha, Kekunnaya. K. (1994). A comparative study of Tulu dialects. Udupi. Narayana, S. B. (1967). Descriptive analysis of Tulu. Poona: Deccan College Postgraduate and Research Institute. Upadhyaya, U. P. (n.d.). Tulu Lexicon: Tulu-Kannada-English Dictionary. Udupi. Brigel, J. (2010). Grammar of the tulu language. Place of publication not identified: Nabu Press. Aiyar, L. R. (1936). Materials for a sketch of Tulu phonology. Lahore. Padmanabha, Kekunnaya, K. (1994). A comparative study of Tulu dialects. Udupi. Bhat D. N. S. (1967). Descriptive analysis of Tulu. Poona: Deccan College Postgraduate and Research Institute. Full Text of "Elements of Comparative Philology". N.p., n.d. Web. 2 May 2017. "Tulu (ತುಳು ಬಾಸೆ)." Tulu Language and Alphabets. N.p., n.d. Web. 2 May 2017. Wikimedia Commons has media related to Tulu language.